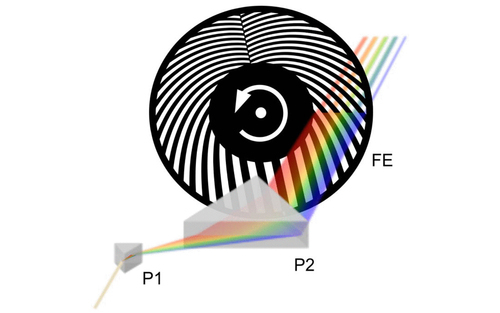 Petermann, C., Beigang, R., Fischer, P.
We demonstrate an implementation of frequency-encoded photocurrent spectroscopy using a super-continuum light source. The spectrally broad light is spatially dispersed and modulated with a special mechanical chopper design that permits a continuous wavelength-dependent modulation. After recombination, the light beam contains a frequency encoded spectrum which enables us to map the spectral response of a given sample in 60 ms and with a lateral resolution of 10 mu m. (C) 2012 American Institute of Physics. Wir stellen eine Kopplungsmethode für resonatorgestützte Absorptionsmessungen vor, bei der Licht durch einen im Resonator platzierten akustooptischen Modulator aktiv ein- und ausgekoppelt wird. Dies ermöglicht es Cavity-Ring-Down-Spektroskopie (CRDS) mit breitbandigen und zeitlich inkohärenten Lichtquellen niedriger spektraler Leistungsdichte durchzuführen. Das Verfahren wird zum ersten Mal mit einer breitbandigen Superkontinuum-Quelle demonstriert. A new coupling scheme for cavity enhanced absorption spectroscopy makes use of an intracavity acousto-optical modulator to actively switch light into (and out of) a resonator. This allows cavity ringdown spectroscopy (CRDS) to be implemented with broadband temporally incoherent light sources with low spectral power densities. The method is demonstrated for the first time using a broadband supercontinuum source. Best paper award OPTO 2011.